While for many the Olympic Games may come to mind as the premier event taking place in Athens, Greece, this year, those seeking to be part of the foremost gathering of IT industry and government leaders from around the world are already making plans to attend the XIV World Congress on Information Technology, to be held May 19-21 in this beautiful and historic city. 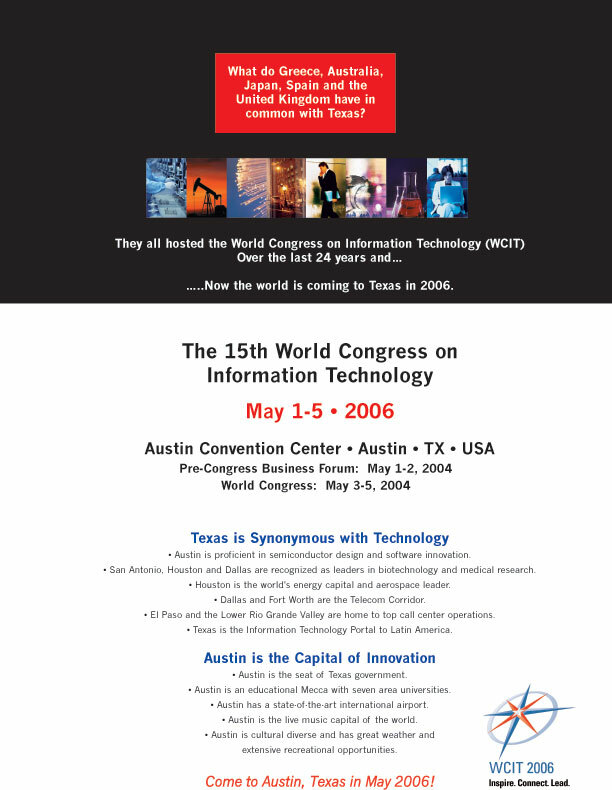 As the Chairman of the World Information Technology and Services Alliance (WITSA), a consortium of 53 information technology (IT) industry associations from economies around the world, I am truly excited to inform you about this “don’t miss” event of 2004. Held every two years since 1978, the World Congress brings together leading IT executives from around the world to share ideas about changing trends in IT from both the supplier and customer perspective. This is not a trade show, but rather the sharing of their vision by ICT leaders, the Olympics of the IT industry. Following the successes in Adelaide in 2002, Taipei in 2000 and Fairfax, Virginia, in 1998, this year’s World Congress promises to be the single most important global event in the IT industry in 2004. The Greek host organization is expecting up to 2000 attendees from more than 50 countries, including senior executives and government officials. In fact, ministers of IT, finance, interior, and communications from more than 25 countries have already committed to being part of this prominent global event. Press coverage will be extensive, with CNN and Time Magazine as two of the media partners. It is a great opportunity to strengthen the worldwide community of IT companies and to promote its use as a driver to improved economies. Past speakers at the Congress have included a mix of IT industry leaders, prominent commentators of the new economy and political leaders and statesmen. Names like Bill Gates, Michael Dell, Carly Fiorina, Larry Ellison, Don Tapscott, Bill Clinton, Margaret Thatcher and Mikhail Gorbachev. Some of the confirmed Keynoters for the 2004 World Congress include Henning Kagermann, Chairman and CEO of SAP, Sanjay Kumar, CEO of Computer Associates, Keiji Tachikawa, President and CEO of NTT DoCoMO, and Adrian Hammerstein, President and CEO of Fujitsu-Siemens. In addition to a top-notch program and world-class speakers, the World Congress offers unique networking opportunities. Two sets of pre-Congress business forums on May 18 will give delegates further opportunities to network and to learn about the maturity and impact of e-business in various sectors of the European economy (“e-Business W@tch”); as well as the design, development and implementation of grids within the EU’s 6th Framework Program, the e-Europe 2002 and 2005 initiatives (“Scientific Forum on Grid Services”). Furthermore, an Innovation Relay Center (IRC) Business Forum will be held throughout the Congress in partnership with more than 250 partnership organizations – and with the support of the European Commission – in order to facilitate specific business partnering opportunities between the delegates. Moreover, there will be spectacular opening and closing ceremonies, golf and sailing competitions, a beach party, and a gala dinner at a magnificent venue, where the WITSA Global IT Excellence Awards will be presented. The WITSA Global IT Excellence Awards, which honor exceptional achievements in the application of information technology around the globe, are a key feature of the World Congress. Winners of these prestigious awards have exhibited excellence within one of three categories: Public Sector Excellence, Private Sector Excellence, and Digital Opportunity. In addition, a special WITSA Chairman's Award is presented to a nominee selected from the entire pool of candidates from all three awards categories. The award ceremonies are a signature event of the proceedings at the World Congress on Information Technology. In honoring the best users of IT, the awards also enable member companies to showcase their customers’ innovation. Delegates at the 2004 World Congress will experience the WITSA Awards during the prime time Congress evening program on May 20, in conjunction with the Gala Dinner – which will help ensure a highly festive atmosphere during this remarkable event. The Gala Dinner is the culmination of the World Congress evening programs, drawing some 1,500 delegates and media. This night will be dressed in the colors of the Olympic Rings, each one symbolizing one of the continents of the globe. I hope you will join me and my fellow WITSA executives from around the world to experience the World Congress’ first class program, top-notch networking opportunities, as well as the many attractions available in the historic Athens – such as world-renowned Greek cuisine and hospitality, and a convenient departure point for many vacation destinations, including the Greek islands. There is no better place to be to learn about exciting new ideas, hear rich and stimulating debate, to meet with preeminent thinkers in IT, and to obtain an insight into our emerging new information economy. Let me make this promise to you – choosing to come to the 2004 World Congress on IT is one decision you will never regret. I am looking forward to seeing you there! The World Information Technology and Services Alliance (WITSA) is a consortium of 53 information technology (IT) industry associations from economies around the world. As the global voice of the IT industry, WITSA is dedicated to advocating policies that advance the industry's growth and development; facilitating international trade and investment in IT products and services; strengthening WITSA's national industry associations through the sharing of knowledge, experience, and critical information; providing members with a vast network of contacts in nearly every geographic region of the world; and hosting the biennial World Congress on Information Technology, the premier industry sponsored global IT policy event, and the biennial Global Public Policy Summit. Founded in 1978 and originally known as the World Computing Services Industry Association, WITSA has increasingly assumed an active advocacy role in international public policy issues affecting the creation of a robust global information infrastructure. For additional information about WITSA and its activities, go to http://www.witsa.org.